A few months ago, I reviewed the Pelikano Jr. Today, we've got the other Pelikano from Pelikan. 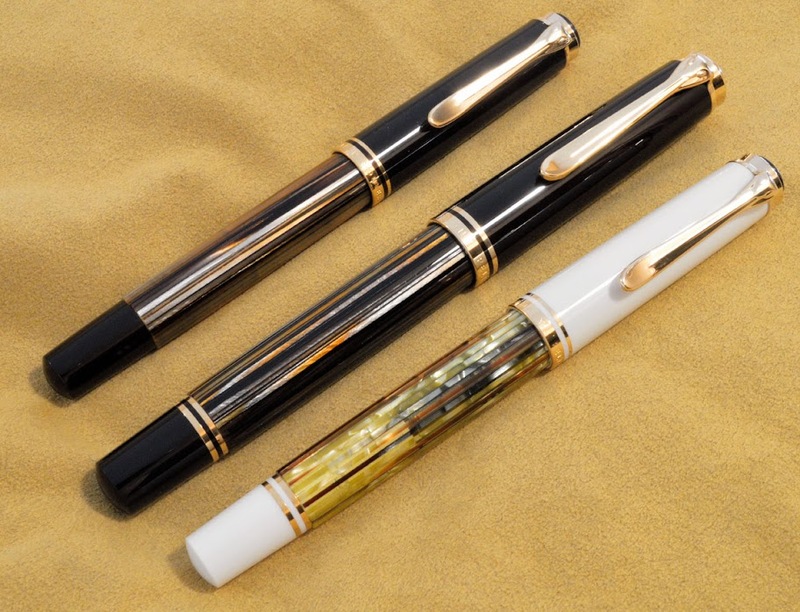 Like the Jr. version, the Pelikano is more whimsical than the other pens in the Pelikan line. It's also way cheaper. These aren't mine at all. I wish I had that white m800. So hot. The Pelikano is an all-plastic pen with a rubber grip. The rubber isn't as soft as the rubber on the Pelikano Jr, but it's still pretty comfortable. I do wish that the dimples were deeper, though. This pen only comes in a couple of nibs, and they're both mediums. One is for right handers and the other for lefties. Probably the grooves on the grip are the only difference, though. Sometimes a lefty nib is ground a little obliquely, but I can confirm whether these are or not. The way that the nib is seated in the section kinda makes it look like a fingernail. (If you're into nails, then check out this nailpolish blog written by the best nail blogger.) I've seen some Pilot pens that do this, too. It's unusual, and I'm kinda into it. There's a breather hole under the feed, just like on the Pelikano. Also in this picture, the bottom-divot on the grip. I've seen some displays touting this as "THE FUTURE!" and it does look like something from space. The aluminum cap is kinda space-aged with the plastic bit wrapped around it. The cap looks like it has a clip, but it's not really functional. It's not flexible at all, and it's set too close to the cap to hold on to anything. It's a glossy plastic with a Pelikan jewel set into the crown. I took a picture of the Jr. with this Big Ben, so that's a thing now. Enjoy this picture of the Pelikano with a Lego Big Ben. This pen fits in the hand pretty well, but I really wish I could post it. I've got a picture of it posted here, but it's not a good poster. I don't know what makes it wobbly, but it's clearly not meant to do that. The Jr. version of this pen is actually more comfortable to hold when it's posted than this one is. That's pretty much the only draw-back. Oddly, the Junior is kinda bigger than the "regular." Here they are next to a pretty common pen, the Lamy Al-Star. Small hands definitely like the Pelikano better. It's actually my wife's pen, and she likes it more than I do. I think the Jr. puts down a bunch more ink than the Pelikano, but it doesn't really look like it, here. While I think these entry level pens from Pelikan are kinda fun, the Junior is the superior pen, I think. It's cheaper and more comfortable. Neither of them are really as nice as the Sheaffer VFM or the Pilot Metropolitan, though, and those pens can be found cheaper in many cases. Jet Pens has both sorts of Pelikano for between $15 and $21. They only seem to have the left-handed Pelikano, at this point though. I also see them on Amazon and Overstock and else where for about that price.